I got a phone call from a very unhappy child. Apparently he had been in my cookie index looking for Oklahoma cookies, and there were NONE! 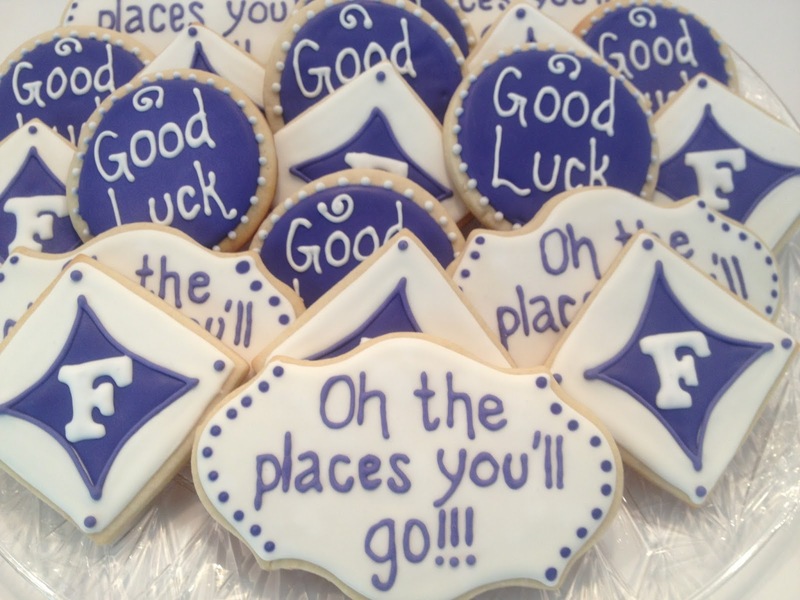 He went on to tell me how many other colleges were represented, and how many Millsaps cookies there were (sibling rivalry). 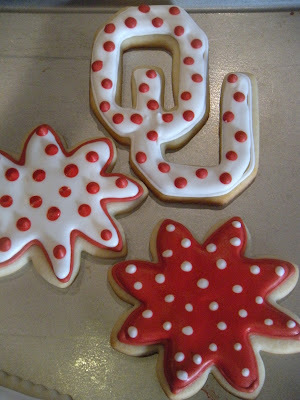 We both knew I made Oklahoma or OU cookies, but they never made it to the blog. Bad mom. So here we go. Boomer Sooner! And just in time for the rematch of Oklahoma vs. Notre Dame. Which didn't work out so well for us last year. So in honor of Nic's last semester, BOOMER! Welcome back to the 50 Chefs/Cooks for 50 Years. My project, of sorts. 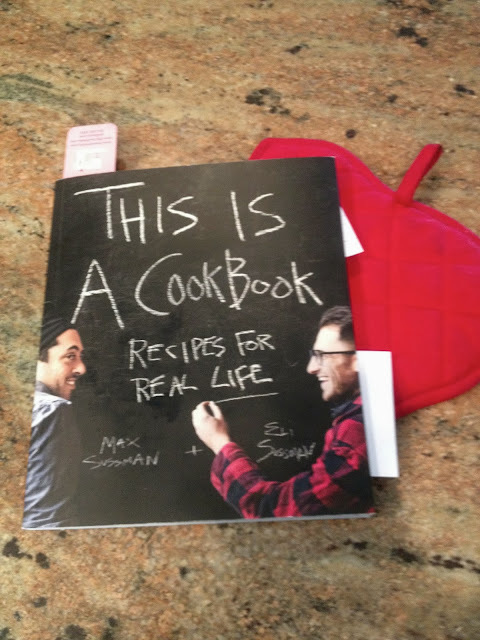 Today's chefs, Max and Eli Sussman are part of the new food revolution (this is a current book...not Dinah Shore era!). I first came across them when their book This Is A CookBook came into the store. I did a Saturday class on this book making a couple of recipes, and decided I had to own it. This doesn't happen a lot. There are dozens of cookbooks passing through my hands every year, and I buy maybe one. But, as a mother WITH A CHILD GRADUATING FROM COLLEGE, in December, I knew he was going to want a little guidance in the kitchen, and this is that book. The food is real. Not fussy. For one or 8, the recipes are easy and hit the sweet spot. Fried egg sandwich, meatball sandwich, peanut butter pie....it really is a cookbook for real life. 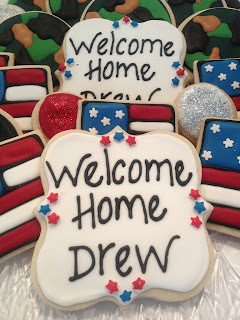 It is colorful, well written, maybe a little snarky (which we all know I love) and delicious. I have to get my cooking done with it so I can hand it off to Nic, my college grad, in a few months, and I was delighted to make a few more recipes. First off, lets talk about the intro, written by Rob Delaney, whom I follow on Twitter. He is hilarious. And then scattered throughout the book are little quips from the boys, ideas, thoughts, just good stuff, even menus. Pages on making pizza, pasta and sandwiches, ideas that spark other ideas. Perfect first cookbook for a guy. Really. I had a few more of my fantastic Iowa chops in the freezer, which I would only ever buy from Fareway Grocery. I guess I better plan a road trip to grocery shop soon! Since this is the most flavorful meat in the world, I just brine it and grill it. But I needed a few things to go with dinner. So I made the Apple Chutney from the Sussmans, as well as the Pear Tart. And decided heck, why not make their grilled Romaine Salad and the Wild Mushroom and Rosemary Potatoes while I was at it. Really, fuss free, easy to make, great results too. All these recipes are the Sussman's with my changes. I am terrible at following directions. And my apologies for the photos. I can't use a flash, and it was a late dinner, so no natural light. Sorry. Trust me, it was yummy! This chutney was easy and a great fall accompanient to grilled pork chops! Saute onions in oil, and turn down heat and cook for about 30 minutes until caramelized. Meanwhile, in a saucepan, cook the apples and water until the apples are softened. Mush up half of them, and leave some chunky. Add the caramelized onions, and the spices and lemon. Serve warm or at room temp. I loved this, however, the skin on one of the apples was a little tough. I think it needed a little more ginger, I used all I had, but it was a little short. I think I would like a dash of cinnamon in it as well. I cooked it hours ahead and let it stay at room temp. Creamy goodness. These were seriously decadent. Saute the mushrooms in a little bit of the bacon fat from the bacon you cooked for the salad. Why dirty another sauté pan? Stir until they begin to brown. Season with salt and pepper and add butter and stir to melt in. Add wine to deglaze pan. Empty the mushrooms into a bowl, and add a little more oil and the potatoes. Cook, stirring frequently. Add the garlic and tarragon (it calls for rosemary which I don't eat), and a little of the cream. Stir well. I then added the mushrooms back in and added enough cream to keep it moist and covered the pan. I cooked it on low until the potatoes were cooked through and then turned off the heat until ready to serve. I reheated, added a little more cream, seasoning and the lemon. These are the most amazing side dish ever. I ate the leftovers for breakfast. Next time, more mushrooms, maybe a variety, and less potatoes. I have the only husband who doesn't like potatoes. We love grilled salad, everyone thought this was so tasty! Mix well and drizzle on wilted lettuce. This was a bit of a delicious failure, but we devoured it anyway! In a food processor, mix flour and sugar and salt. Add butter and pulse until coarse and gravel like. Mix the eggs and the ice water and add to the dough pulsing until it comes together. Do not add all the liquid unless you need it. My dough was way too wet and troublesome to roll. When dough comes together, flatten into a disc and wrap in plastic wrap and chill at least 2 hours. When ready to roll, preheat oven to 375˚. On a floured surface, roll out dough. My dough was really moist and stuck quite a bit. I did more pressing than rolling, and then tried to freeze it for 15 minutes before baking to firm it up. The juice still oozed all over the pan, but it was still yummy. I didn't measure or shape it much, I worked with it as a rectangle so I could bake it on a jelly roll. Place the filling in the center, not mounded, and fold up the edges. Bake about 20 minutes until the crust is golden. Serve warm with vanilla ice cream! I am going to try this one again, and this easy dough will be a great vehicle for any fruit. So we knocked out 2 more chefs on the list of 50. These guys should be on a lot of lists. 44 to go! So what are you waiting for? Get in there and cook! Deborah's new book is called Vegetable Literacy, and it is on my Christmas list. Her original book is Vegetarian Cooking for Everyone, and for years when people were shopping for the vegetarian or healthy person on their list, I directed them to this book. It is continuously on the list of the all-time greatest cookbooks. The new book is getting great praise, and I was happy to find a recipe from her new book on the Williams Sonoma website. I felt I needed to include her on my list, because she really brought vegetables to the center of the plate. And not necessarily for strict vegetarians. It seems like so many people think of the veg as the afterthought. Steamed broccoli (YUCK! ), green bean casserole (YUCK!) and even the tired crudité tray with carrots and celery sticks. With the emphasis for so many people going away from gluten, maybe less meat, a vegetable book is needed more than ever. As with many cookbooks I own, it is a great point of reference, kind of an idea book. I am hoping the new book is going to be better about making meals my family loves. I think Ina really did a great job highlighting veggies as well in her books, and she is on this list too, coming soon. Ina got everyone roasting veggies in the oven, and what delicious results! So I am tossing a piece of meat on the grill for Mr. Preppy and making these zucchini tartines from Deborah's new book as a side for him, main for me. I changed a few things around, but these were delicious. They would be lovely with any vegetable, banana peppers, mushrooms in the fall, even spinach and artichokes would be delicious. Even Mr. Preppy thought so. With many thanks to Deborah Madison for teaching us that vegetables are substantial, sustainable and delicious! In a nonstick fry pan sauté the zucchini in olive oil for a minute or 2, and then add a splash of water and cover to soften the zucchini. Add the herbs, lemon zest and salt and pepper. Brush toasted slices with olive oil and rub with garlic, I ran it through the press first. Toast the baguette slices over a grill or on a grill pan. Top with ricotta and slices of zucchini. Slice and serve. And third chef, Dinah Shore and Corn Crab Cakes with Jalepeño Tartar Sauce. Next up....let's just say we are heading down memory lane...What are you waiting for? Get in there and cook! This will be a regular dinner around here. Delicious! So here we are on my third, Chef of 50 that has influenced me. Dinah Shore. I'll wait while my young readers click this link and read the synopsis on the Dinah Shore fan club. So, obviously I was a fan in the 70's. Her singing career took off in the 50's, but I'm not old enough to remember that era. I remember her TV show and watching it in the summer, out on our big screened in porch. I loved all those talk/variety shows. Dinah was really one of the first "celebrity" cooks. 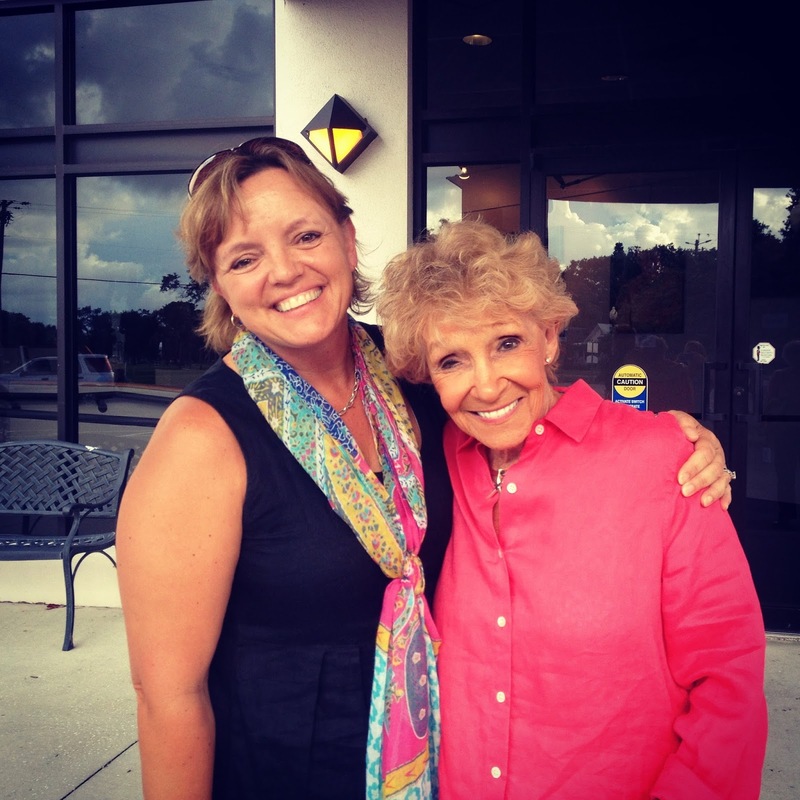 She did cooking segments on shows, and she was a prolific entertainer, singing duets and doing interviews. Here is a YouTube clip of Dinah and Frank Sinatra cooking. Just listen to that sweet Southern voice. How could a little girl from Iowa not be enamored with her!? I am the proud owner of The Dinah Shore American Kitchen cookbook. I wish I had its dust jacket, but I tossed it years ago, however, the book is signed to me. I know. It was my first signed cookbook and kind of started this little addiction to acquire signed books, cookbooks, that is. Unlike many celebrity books, this one is fantastic, almost timeless. The recipes are relevant today as they were then. She was ahead of her time with the international cuisine in the book, especially the fresh ingredients and Mexican themed dishes. Like many of my older cookbooks, this one has been on a shelf away from the kitchen for many years, but there were many things I wanted to make, and I will be back. I decided that any chef or cook in my 50 Fabulous series, that has a book I own, I have to read it, really read it. I need to remind myself of why I loved them in the first place. Dinah was in amazing shape, she was a great golfer, and did many charity events. She refers many times throughout the book about the Fat Farms and Pamper Palaces she would check into after writing one of her cookbooks. After the First Chef Dinner (featuring my Mom), then Cheese Soufflé (featuring Chuck), I could use a Fat Farm. The previous meals were fantastic, but a little on the heavy side. So I thought the crab cakes would be a nice light dinner for a scorching September night. I was absolutely correct! I had to make a few changes, which I noted, and I lightened up her tartar sauce. I will never make bland colored crab cakes again. This was a delicious dinner....healthy too! Blend mayo and eggs in a bowl. Add corn, pepper, chilies, onion, mustard, white pepper, Worcestershire and cayenne. Stir in bread crumbs and fold crab in carefully. Shape into patties,she says 12! I made 6 patties and would say 3 servings, not 4. Look how colorful this is! They cooked in a few minutes. Heat the oil in a heavy, large skillet. Cook the crab cakes until lightly browned on each side. Garnish, I used pickled okra, lemon wedges and jalepeños. Serve with tartar sauce. Combine all ingredients, Dinah suggests a food processor and pulse until finely chopped, but I like it chunky so I skipped that step. Transfer to a bowl and refrigerate until ready to use. Dinah would be disappointed that cornichons and baby corn are not available in the supermarket anymore. At least not in mine. Since she was a fine Southern woman, I thought she would approve of some chopped bread and butter pickles from Blackberry Farms in my tartar sauce and my pickled okra garnish. They were both tasty. The crab cakes were full of fresh veggies, so colorful and really one of the best I have ever had. I will be making them often. And the Jalepeño Tartar sauce would be tasty on any piece of fish or in a fish taco. Thanks Dinah! My fabulous 50 Chefs for 50 Years started with this post. 1st chef, Mom, and Steak In A Bag with Chocolate Ambrosia Pie is found here. 2nd chef, Chuck Williams, founder of Williams Sonoma, and Cheese Souffle. Stay tuned. 3 down, 47 to go! What are you waiting for? Get in there and cook! Cookies? 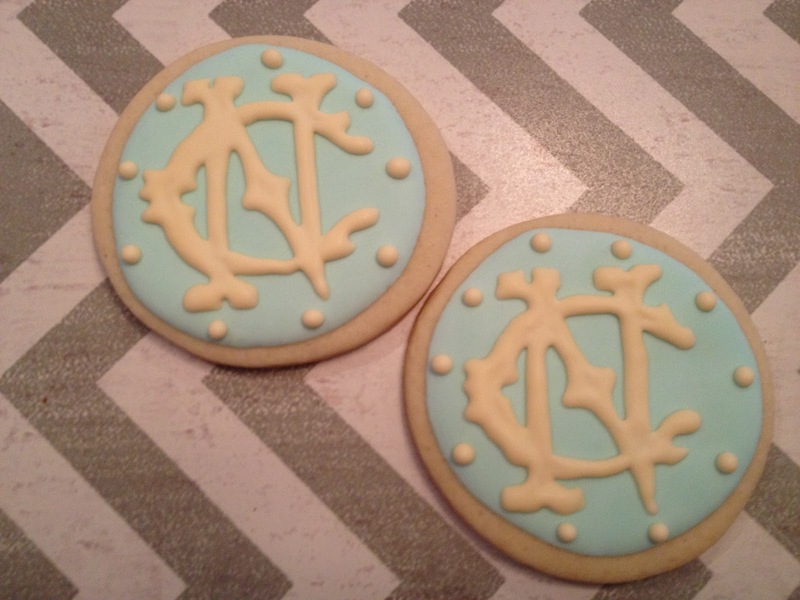 Why yes, I have been baking a little! 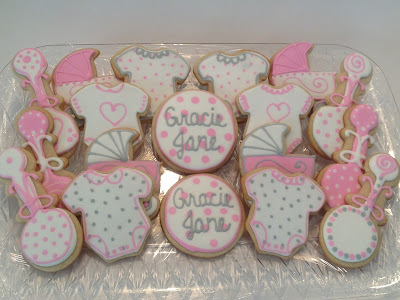 I am always making cookies, just need an event to get my wheels turning, but I have really not been blogging them. Too many order inquiries, which I don't do. And cooking is my passion, my love and my family cannot live on cookies! So here's a little roundup. I made her 1st birthday cookies too! Hope I make her Sweet 16 some day! For the First Home Game....Victory! 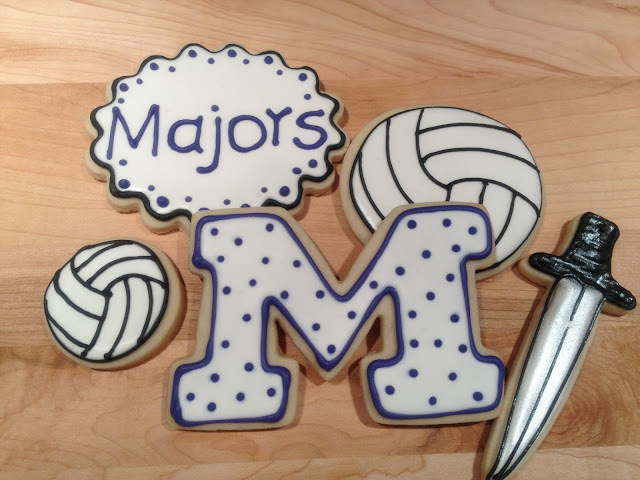 Go Millsaps! This is the second installment in my 50 Chefs for 50 Years! Chefs and cooks that have inspired my culinary love. This one is my boss, so to speak. I have been living his culinary dream for longer than a lot of marriages! Chuck Williams, founder of Williams Sonoma. So, back in 1971, I was skipping off to Second Grade at St. Boniface, in Clinton, Iowa, and Chuck Williams was publishing his first catalog. He had been in the hardware and house ware business in the San Francisco area for about 20 years. That catalog launched an empire, and I have been working for him the last 16 years. Amazing, in so many ways. I had the honor of meeting Mr. Williams in 1999 in Las Vegas. 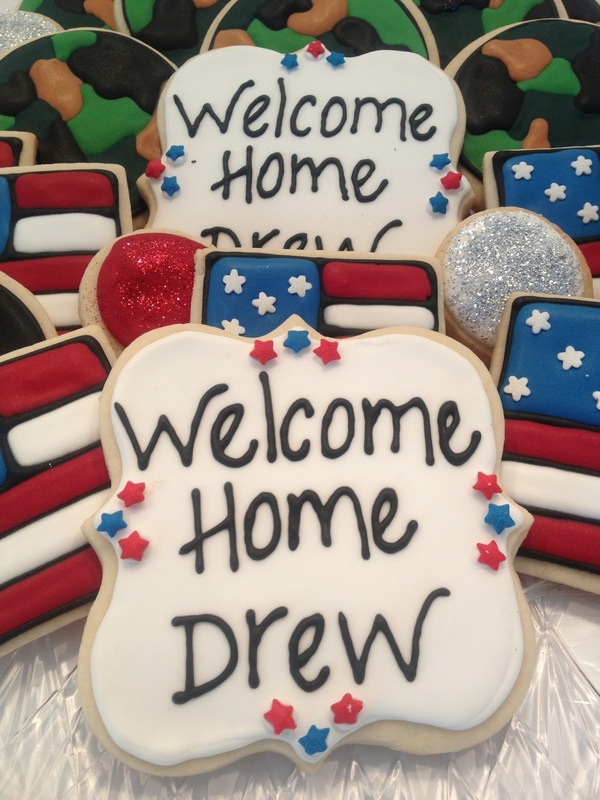 He was in the Williams Sonoma store, and I had gone to the mall, specifically to check it out. I was shocked and thrilled as there was no one in the store but a few associates. I had a nice chat with him and he signed a book for me. Chuck (as we affectionately call him at work) was really a visionary. I have been reading the book of letters written between Julia Child and Avis DeVoto, and Julia, as well as Chuck, saw the opportunities bringing French implements and cooking techniques to the American home. And he and Julia were friends. Chuck fell in love with the copper cookware found in France, a much better quality than the lightweight aluminum pans found here. I to have fallen in love with them. My collection has grown over the years, and I treasure each piece for its heirloom quality. 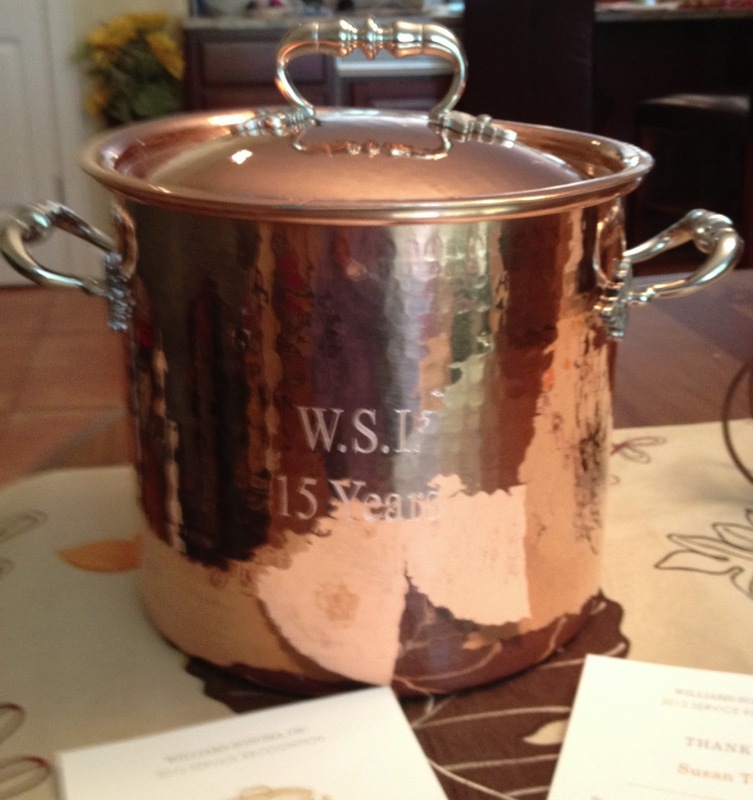 Last year for my 15th Anniversary at Williams Sonoma, this copper soup pot was my gift! (It's Ruffoni, Italian, but still an awesome pot!) He also brought the French porcelain dinnerware Apilco, famous for their soufflé dishes. So naturally, I knew this was what I was going to make, my first attempt ever at a soufflé. A few years back, I bought a book at the store called The Merchant of Sonoma, and it is basically a biography of Chuck Williams and is full of his favorite recipes and his very interesting life, and what a life! He is a testament to good food, good wine, entertaining and working your passion. In October, he will turn 98 years old. So, in honor of my place of employment and a man who brought chefs, techniques, books, tools and cuisines to the home cook, I am pouring a Campari and Soda (Chuck and I both love this) and am making Chuck's zucchini and a cheese soufflé. 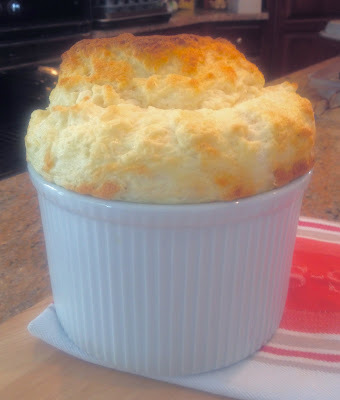 My dilemma was whether to bake it in my Apilco porcelain soufflé dish, or my very beautiful copper soufflé dish. My first attempt I used the copper pan, which is a little too squat and big to get the big rise over the top. But do not be fooled. it rose and was delicious. Since I had more cheese around and the smaller soufflé, I decided to do it again! And in true French form, the Apilco was perfect. The soufflé, as you can see in the photo was perfection! So here's to you Mr. Williams. Thank you for letting me work in your amazing store for 16 years. I have learned so much, I have made life long friends, and I have become a pretty good cook too! Preheat oven to 350˚. If using a 1 1/2 quart soufflé, make a parchment collar and secure with string, otherwise you should be fine with a larger soufflé. In a saucepan over med-low heat, melt the butter and then whisk in the flour and stir continuously for 2 minutes without letting it brown. Gradually pour in the warm milk, and whisk constantly until smooth with the heat upped to medium. Continue whisking until the sauce boils and thickens, about 2-3 minutes. Remove from heat and allow it to cool for 5 minutes. In a separate bowl, whisk the egg yolks until pale and yellow. Slowly add a little hot sauce from pan to the yolks whisking constantly, continue, incorporating all sauce into yolks, and then add Madeira, cheeses and salt and peppers. In a clean bowl or in a mixer, whip the egg whites until soft peaks form. Gently fold into the cheese mixture with a rubber spatula. Spoon into soufflé dish and bake until puffed and golden. Do not open the oven! About 35-40 minutes. Serve immediately. Perfectly golden, and risen, although not over the top! Obviously didn't need a collar! Shred the desired amount of zucchini. Do not peel, but wash and dry well, and trim off the ends. In a large fry pan, I used a drizzle of olive oil and put the zucchini into hot pan. Season with salt and pepper and stir frequently until the desired doneness, just a few minutes. Squirt fresh lemon juice on cooked zucchini, and we served it with fresh grated parmesan. Delicious! I let mine cook a little longer to try and evaporate the moisture. The lemon is yummy! 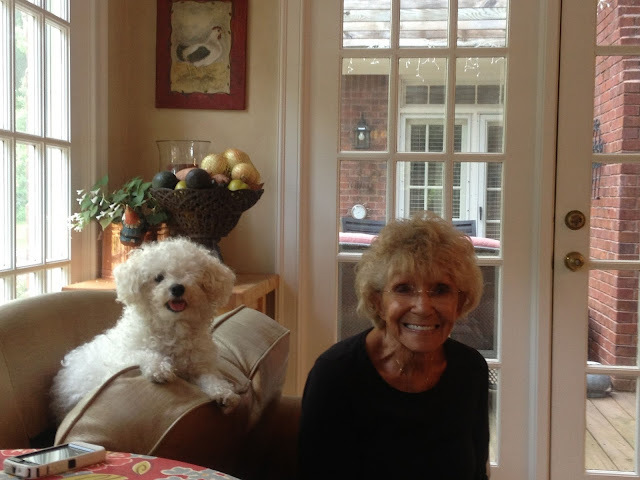 Don't miss my First Chef, Mom! And Steak In a Bag! And stay tuned. Chef #3 will be a big surprise! It's only fitting that I start at the beginning right? The 50 chefs (cooks) that have inspired me, must begin at home. My mom cooked almost every night, it wasn't easy or cheap to take 5 kids out to dinner. Mostaccioli night was every Sunday, steak every Saturday. We ate lots of chicken drumsticks, pork chops, sarma, and wild game. Pheasant, venison and moose were not uncommon, all "bagged" by my hunting father. My dad liked (and still does) to eat well. A meal on the table. He would disapprove of my wine and cheese and popcorn dinners! Our dinner table was in an octagonal room, all windows, that perfectly fit our round table and all 7 of us. In the summer we ate on our huge screened in porch, just a block from the Mississippi River. To this day the shrill locust call brings me back to that table. It will also play a part in a future chef post! By the time I was in high school, there was no one around but me. My parents entertained a lot; big Christmas parties, bridge group, and then dinner parties. They were famous for the theme parties, and a toga party was the highlight one summer. The neighbors who were not invited had to smell that amazing lamb on the rotisserie all day long! After I was married, my mom gave me her original recipe box, and filled it with recipes she loved. One of them was Steak In A Bag. She said it was a fun meal to make for company and delicious. I tucked it away and decided now was the time. I called my friend Rosalie and told her what I was up to and invited her and her husband for Steak In A Bag (hilarious, isn't it?) She was all in and wanted to make an appetizer to go with the theme. So in true Joan Petitti fashion, she made Rumaki. Yum! We had a salad every night growing up, although it was nothing fancy; iceberg, vinegar, oil, salt and pepper. I decided to amp it up a little and do an iceberg wedge with blue cheese vinaigrette. It's kind of ironic, because I remember when blue cheese was becoming popular and my mom loved it. She started crumbling it on our very perfect salad, and I was not happy about it. One night I ran away because of her thoughtless gesture. I wasn't gone long of course, but I really never got up the nerve to taste the stuff until I was in college. Now I love it! I knew the men would need a little more bulk with dinner so I roasted mushrooms and new potatoes with butter, olive oil, garlic and thyme. And then came dessert. As I said, we didn't dine out frequently, but when I was the only one home, my parents ate out more and more. Being a teenager, I could sort of decide if I was interested in their choice of restaurant. Bishop's Cafeteria was a favorite. You wouldn't catch me eating public food on a buffet now, but this place was pretty high class...for a cafeteria that is, chandeliers and tablecloths. I was like a kid filling up my tray, and getting to try all these standard American classics that we never ate at home. 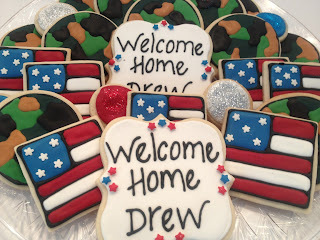 There were no casseroles in our house, no mac and cheese, and dessert was usually a cookie or brownie. I'm pretty sure we went so my dad could eat fried chicken, something my mom never made. I can't tell you a single thing I ate at Bishop's except Chocolate Ambrosia Pie. It was a chocolate pie with whipped cream and chocolate curls. I think it was those curls that really lured me in, they were unlike anything I had ever seen. The pie was rather pudding like, but pudding was another thing I never had much of as a kid. So there you have dessert for our tribute dinner. Everyone in my family who has heard the menu wanted to come, including my mom and dad! We all decided that dinner was great. The steak needs a little tweaking, really a thicker steak would be better. The cheese was not awful at all! The salad is a keeper, I will make this dressing often, and the pie was the hit of the dinner. After making dinner, I did Google the recipes to see what was out there. My Ambrosia Pie is different than most I saw, but we all thought it was amazing! The recipes we used follow, and stay tuned for Chef #2...another childhood classic! Sookie and Rosalie eying the Rumaki! Mix butter, oil, garlic and seasoning together. Slather on all sides of trimmed steak. Mix cheese and breadcrumbs together and press onto butter mixture, coating steak well. Place inside paper bag, and fold over the end and staple to secure. Place bag on rimmed cookie sheet and bake in a preheated 375˚ oven. Bake 20 minutes and increase oven to 425˚ and bake 15 minutes more. Let stand for 5 minutes before opening bag. Most of our steak was over done. But there is no way to check the temp without opening up the bag. I couldn't find a thick sirloin, so I think I would cook it 15 minutes and then up the heat for 5-10. You can always put it back in. Also, Move the bag around so it cooks evenly. The overcooked portion was still delicious! set the wedge up so the dressing goes into the nooks! In a jar, mix mustard, vinegar, salt and pepper. Whisk in the oil to taste and half of the blue cheese. When you are ready to serve, pour dressing over wedge and garnish with remaining blue cheese and bacon. Make 4 servings. Mix the ice cream, gelatin and pudding with a hand mixer and pour into prepared shell. My mom's recipe calls for graham cracker crust, but I was in the mood for a real pie crust. So whatever pleases you. It also called for a layer of Cool Whip which kind of grosses me out, so we went with whipped cream and on large chocolate shaving. This was hands down the hit of the night! !